Savvy Apps’ Agenda, one of the most popular third-party calendar apps for iOS that we’ve been covering on MacStories for years, has been updated today to version 4.0, which adds a beautiful new user interface and builds upon the previous version’s app integrations, support for Reminders, and gesture-driven event management. 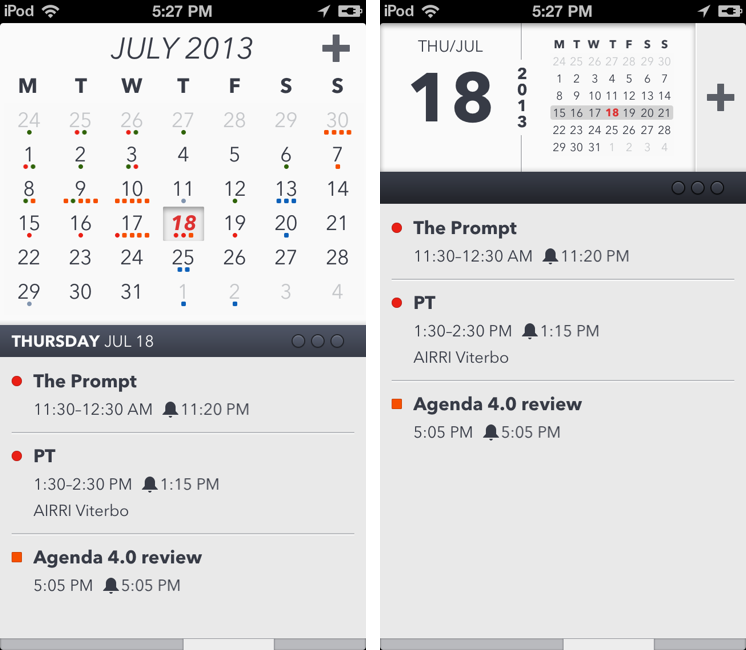 Agenda 4.0 is sold as a separate app for $1.99 on the App Store. I’ve had the chance to test Agenda 4.0 before today’s public release, and as I kept using the app I noticed how it was turning into a powerful complement to Fantastical, my favorite calendar client for iPhone. As I have discussed this week on The Prompt, in fact, I’m currently going through my annual re-evaluation of my workflow, and, partly because of my curiosity in regard to iOS 7, I’ve started using Apple’s Reminders on a daily basis again. Reminders are easy to use, the app is fast, and, more importantly, it’s one of the Apple apps that can sync in the background all the time with iCloud. I can integrate Reminders with IFTTT for iPhone, and, overall, I have been enjoying the simplicity and deep system-wide integration of Reminders. While I’m a big fan of Fantastical’s Day Ticker (I think it’s one of the best calendar interfaces ever shipped on iOS), Agenda allows me to view calendar events and reminders in the same list (something that Fantastical for iPhone still isn’t capable of), and with version 4.0 this list is even more polished and clear than Agenda 3.0. Agenda 4.0 still comes with a swipeable “gallery” of calendar views that starts from a year-based visualization (in two groups of 6 months each), goes to a single month display, and then drills down into an individual list of events and reminders. Alongside horizontal swipes to change between views, Agenda 4.0 lets you swipe vertically to navigate through time: this is particularly impressive in the month view (where you can move across months) and the list view (which lets you scroll through events from different months and subtly fades a translucent “month bar” into view to give you context). The list view is the only one that can’t scroll to any point in the future, but will only display events until the last available one; in every view, you can tap the iOS status bar to go back to the current day, which is a handy shortcut. The month view can be resized to a smaller version that doesn’t show colored dots for events and reminders, but I prefer Fantastical’s take on the month UI, as Flexibits’ app displays events for the next month below the list of the current month, automatically advancing the month calendar when you scroll down. Agenda 4.0 only displays events for the current day and lets you swipe at the bottom to move between single days – a workflow that, for me, isn’t nearly as intuitive as Fantastical’s. As I explained above, the best part of Agenda 4.0 is, based on how I use events and reminders these days, the list view. The way event details are shown in Agenda 4.0 has changed, too: instead of being displayed in a single-day page and then as individual entries, there’s a new “event flyout” that slides in from the right side of the screen as you tap an event (either in month or list view). 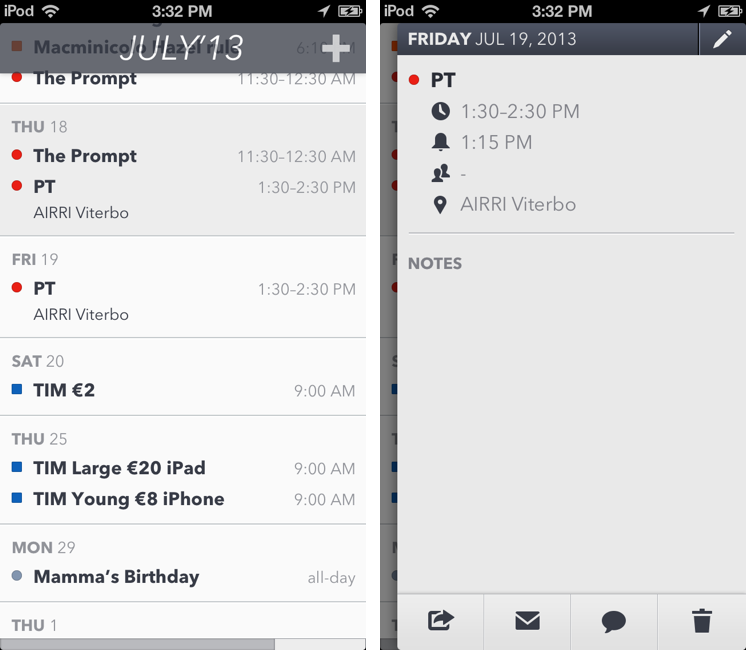 The flyout displays a colored dot for the calendar (or square for Reminders list), event name, times, alerts, attendees, location, and notes with the usual buttons to share via Messages, Mail, delete, and an improved sharing menu that now includes apps like Drafts, Due, Clear, and Scratch. I like the event flyout, as it fits well with Agenda’s layer hierarchy and fast transitions. In the Applications screen of the Settings, Agenda offers options to open map links in Apple Maps, Waze, or Google Maps, and web links in Safari or Google Chrome. As a Google Chrome user, I’m happy to see that Savvy Apps is supporting the application callbacks that allow Chrome to easily send you back to Agenda with the tap of a button. 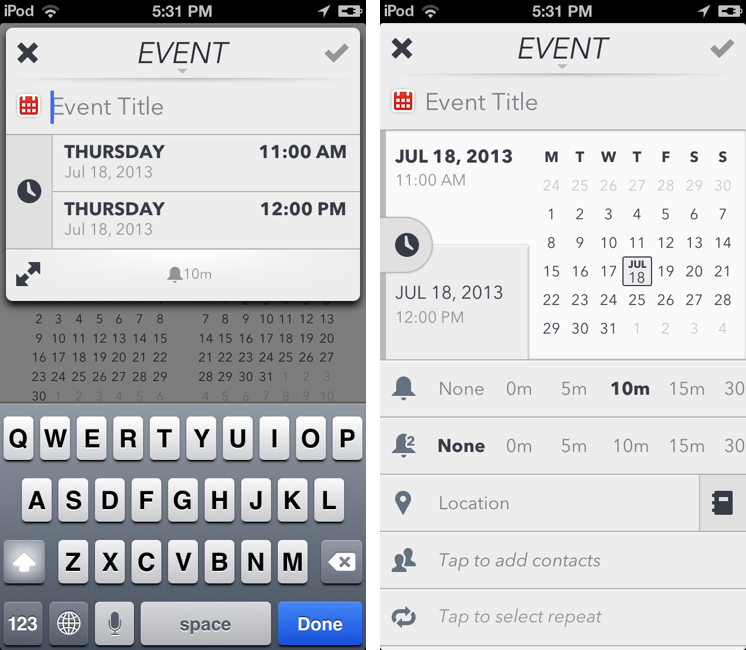 Event creation has been revamped in version 4.0, adding support for a new “Mini” mode as well as Fantastical. The “Agenda Expanded” mode is a graphic restyling of Agenda 3’s event creation screen: it embeds a small calendar to pick a day, separate tap areas for start and end times, scrollable bars for two alerts, and fields for location, contacts, repeat settings, and notes. The alert and repeat settings aren’t as advanced as the ones found in Week Calendar, but they’re better than several other calendar apps I’ve tried over the years; I like how you can pull a clock icon from the left side to turn a normal event into an all-day one, and, as usual, there are default settings for alerts, calendars, and duration that you can tweak to your personal preferences. Agenda Mini is a nice and fast way to add a new event: it is a slimmed down version of the Expanded panel, but it only contains a title field, start and end times, and it shows the default setting for alerts. You can expand the Mini mode with an icon in the lower left corner, and in both modes you can tap on the “Event” button in the title bar to switch between event and reminder creation, which makes Agenda also a nice way to add new reminders to iCloud. Natural language recognition on the iPhone works just like you’d expect from Fantastical. Even without an Internet connection, you can write down simple sentences like “Genius Bar tomorrow at 5 for 30 minutes” and Fantastical will automatically compose a new event recognizing various values in your input, such as “tomorrow”, or “for 30 minutes” to indicate duration. Fantastical will assign these values to a new calendar event with a nice animation that, just like on OS X, highlights recognized words and “flies them down” to the main event UI (based on iOS’ standard EventKit). The fact that event details such as duration, time, and location update instantly as-you-type makes for an incredibly cool experience. Savvy Apps understood that several users depend on Fantastical’s natural language recognition, and they’ve been smart enough to leverage the Fantastical URL scheme and offer Fantastical as a built-in option in Agenda 4.0, so you won’t be forced to use Agenda if you have Fantastical installed on your device. Simply choose Fantastical in the Event Creation settings, and instead of Agenda Mini/Expanded (or iOS’ native event creation, also supported) you’ll get a popup field where you can type your event with natural language, tap a button to be taken to Fantastical, which will parse the received text as you’d expect. In Fantastical, you can then add the event or cancel it, and in any case you’ll be taken back to Agenda automatically (thanks to the power of x-callback-url). I believe this is a very humble and intelligent choice by Agenda’s developers, as it would be silly to ignore the fact that Fantastical’s language parsing is a better system most of the time. Having Fantastical support in Agenda enables me to use both apps for different purposes, and I’m very happy about this addition. There are some aspects of Agenda 4.0 that I’d like to see changing in a future update. An option to check off reminders, available in Agenda 3.0, has been removed from 4.0, and now I have to open the Reminders app to complete reminders. Speaking of completed reminders, there’s no way to hide them in Agenda 4.0, and I believe this can cause some confusion if you complete a lot of reminders every day and you’d like to see them disappear when they’re done. You can’t switch to the quick reminder creation mode when you choose Fantastical for event creation, and, similarly, editing an event in Agenda when Fantastical is the default app for event creation will bring up iOS’ stock event UI, which I’m not particularly fond of. 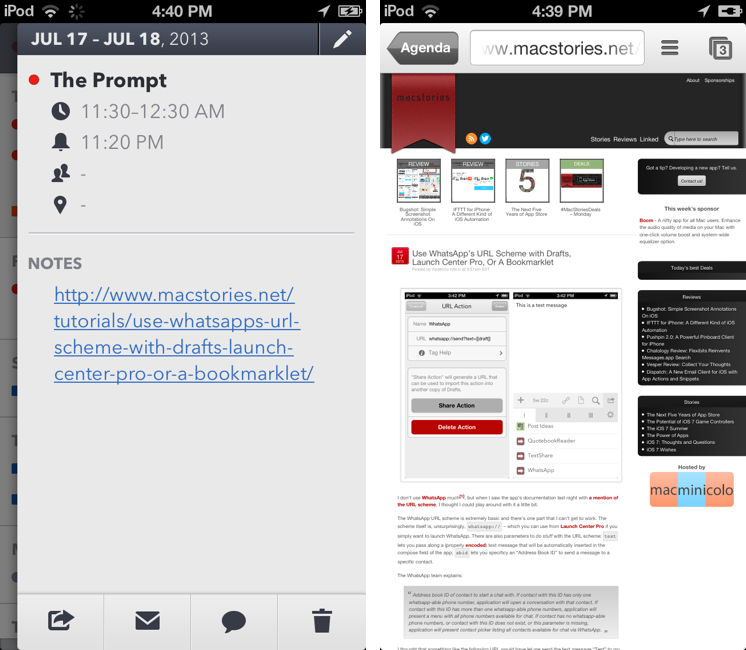 Agenda 4.0 is iPhone-only, and I would love to see an iPad version. 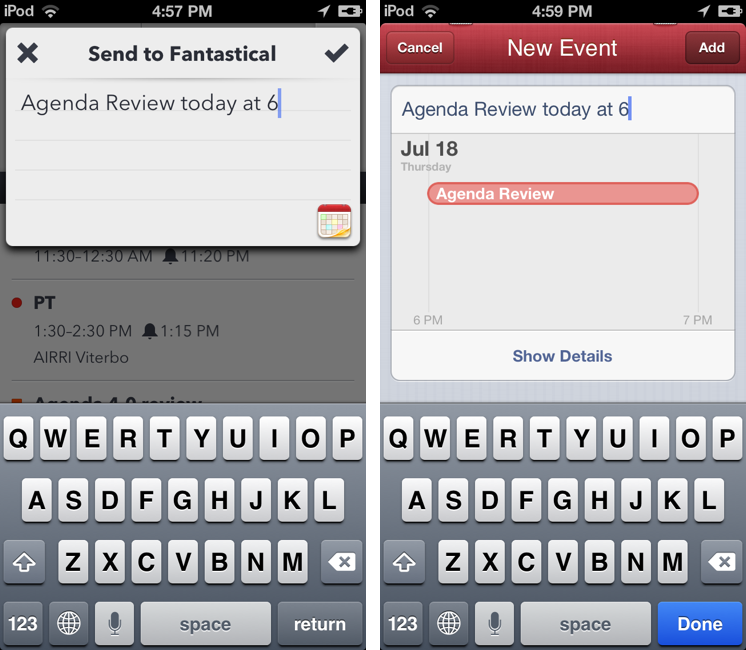 Agenda 4.0 is a solid calendar client that can be a great solution for users of iOS calendars and Reminders. I like how Agenda can give me a complete overview of a day’s events and reminders, and I appreciate the focus on inter-app communication with support for Chrome, Drafts, and Fantastical. Personally, I wouldn’t use Agenda 4.0 as my only app for event creation, because I still prefer Fantastical’s natural language parsing, and for this reason I’m glad Savvy Apps decided to natively support Flexibits’ app. I’ve been enjoying Agenda 4.0 because of the way it coalesces events and reminders from different calendars and lists in a single view, which is extremely useful for my workflow. Agenda 4.0 is $1.99 on the App Store.